This page is about my Communicating Strategy book. It sets out the background, the structure and content, what you can learn from it, and how you can use it in your organisations. Why write a Communicating Strategy book? My communicating strategy book was written to address a gap in the market: There are lots of books about strategies for communication, but far fewer about how to communicate strategy specifically. The book came from listening to strategy being communicated, and being involved in the planning and communication of strategy over 20 years. This included consultancy and line management experience, with many diverse organisations, across the world. The thing that finally started me writing was being annoyed by the rubbish that was talked about communicating strategy. Boy was I angered by that. As a result, my book, Communicating Strategy was written and published by Gower. 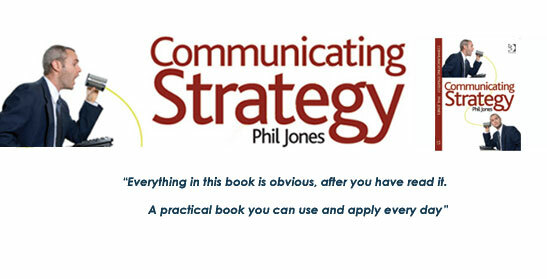 To improve how you communicate your strategy, you can read the book, learn more from this website, or contact me, Phil Jones, directly for training, talks and consultancy advice. For various ways to buy the book, then go to this page. Here are some reviews of the book that might help you decide. There is also much more material on this website…To read a structured guide to Communicating Strategy on this site visit Communicating Strategy: A structured guide for Executives. To understand socialising strategy visit Socialising Strategy (Or Socializing strategy). If you are looking for a strategy communication plan, the very last chapter gives you a format and guide to writing one. It builds on the questions and ideas in all the previous chapters. It is the last chapter because it refers to all the previous chapters which describe how to prepare and think about that communication plan. If you don’t have the book yet, you can also get advice on developing a strategy communication plan from our Communicating Strategy page. “Communicating Strategy”, helps you plan and communicate your strategy more effectively. It explains how to think through the design of the communication of your strategy and gives you techniques that ensure people get your message, engage with it and contribute to your strategy. It addresses a space in the market: a practical guide that will help you communicate and socialise your strategy better. It has a very simple premise: the more people understand and engage with your strategy, the more they can help you deliver. However, that requires a clearly presented ideas and a compelling message, communicated effectively. One that is relevant to them and helps them understand how they can make a difference. That is what Communicating Strategy is about. The ideal situation is when all your strategies and plans can be burnt. (Yes we mean that). You can do this when the strategy is in their heads and they are using them to make decisions every day. Communicating Strategy helps you communicate your strategy so people get it logically, care about it emotionally, and know what they have to do about it, actually. It is not just about what people know, it is about how they feel, their commitment and what they believe, that makes a difference. 2) What will you learn from reading Communicating Strategy? Communicating Strategy addresses “Ten heresies”. Heresies that will challenge your thinking and beliefs about people in organisations and communicating the strategy. Heresies that cause organisations to have so few people that understand the strategy. Heresies that you can unlock. Here are the ten heresies of Strategy Communication from Chapter two of the book. If you want to engage people you have to reach them. Communicating Strategy helps you think through who are the right people, what state of mind are they in at the moment, and what you need to do to change that. People outside the organisation also need to know about your strategy. Communicating Strategy provides tips and tools to help you develop the compelling strategy for your customers, investors, stakeholders, regulators, suppliers and other external bodies. Communicating Strategy has a chapter dedicated to making your strategy compelling. This includes proven techniques for engaging your staff, describing the various aspects of the the strategy in a way that engages people and ensuring you communicate the message with integrity. Communicating Strategy contains a chapter specifically about telling the story of your strategy. How you can develop the stories that get your message across. How to tell the story of the strategy in a compelling way, so it engages the maximum number of people. How to choose your language so its matches that of the organisation. It is not just about telling other people. It is about engaging them in a conversation. It is also about listening to the feedback and reactions you get. Communicating Strategy specifically addresses how to maximise the feedback so you can create a better. more compelling, message. Communicating Strategy contains a chapter dedicated to aligning the organisation behind the message of the strategy. You would not want to put all your effort into communicating the strategy, only to find that the other parts of the organisation are working against you. The Aligned organisation provides a checklist for ten major areas of the organisation to ensure the message it sends out is congruent with yours. In some organisations the culture may have switched off and discouraged feedback in the past. Some organisations suffer from change fatigue. To help you overcome this, Communicating Strategy provides specific advice on diagnosing, identifying and unlocking such blocks, so you can be sure that people are listening this time. Avoid mistakes, learning from the success of others. Communicating Strategy is based on over ten years’ work communicating strategy in a whole variety of organisations. From FTSE100 and International Financial organisations, through to SMEs and dot-coms. Across the Public sector as well as the private sector. Communicating Strategy contains stories, case studies and anecdotes from a whole variety of organisations, situations and strategies. Rather than describing chapter one, simply download and read it yourself for free. You can download chapter 1 of Communicating Strategy. Heresy number 2: You don’t have all the answers. Heresy number 3: Your staff are interested in the strategy. These ten heresies are expanded in Chapter two of the book. Strategy is about organisational change and measured by results. The effectiveness of the communication of your strategy is measured in the changes in the actions and behaviours of individuals and teams. These changes in actions and behaviours should lead to those more strategic changes and results. This chapter starts the exercises and sets the scene. it explores who your targets audience, what messages you want to get across to them and why? An important part of this analysis is the relationships you have with the various groups in the social system that composes your organisation. This will influence who you speak to and how you speak with them. It may also dictate the channels that are most effective for getting different parts of the strategy message across. The next two chapters of Communicating Strategy explore how you want change to occur, and look at the message of your strategy from the perspective of those who will be receiving the message. It describes the mindsets, motivations and typical reactions that you get when new strategies and change programmes are announced. Much of this book is about making sure the strategy is communicated so people understand and are engaged with it. However, there is also aspect to communication that is no nonsense discipline. At some point, when people are not complying, you will have to get serious and potentially get rid of people. This chapter also explores some of the aspects of communication that go behind the message to show you are serious. This is ‘The discipline of change’. It considers what is in it from the perspective of the various players. You can explore ‘what’s in it for them?’ from different people’s perspectives so you can build an even richer understanding of the various players involved. Using this you can target the message, the information and how you communicate and socialise the strategy with each group. Part of the art of communicating your strategy is telling its story. Story telling is an art that transcends cultures. 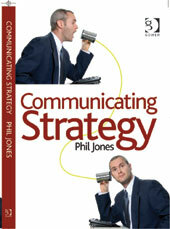 Communicating Strategy, contains many case studies, anecdotes and stories. These all come from real organizations or clients and are chosen to illustrate points, bring out aspects of the technique or give you an example of how to someone else has tackled a situation. This theme of telling stories permeates the book. Chapter six explains how to develop the story of your strategy so it is complete. It concentrates on the content of the story of the strategy. What is the strategy and what are the aspects of it that will need to be told? How can we tell these various aspects in a coherent way? The quality of the thinking within the strategy will strongly influence the telling of it. Chapter seven addresses the telling of the story of the strategy. It provides techniques to tell the story more effectively, so the story is easy to socialise. The chapter explores ways in which you can get your message across more effectively; how to engage people, pacing them and communicating the message, so it engages the many different ways in which people think about things. It also provides ways to prevent you stifling feedback through the accidental messages you might send out. It tells you how to be more systematic about gathering feedback and getting people to participate in the strategy, because listening sensitively to this feedback enables you to refine the message and its communication. Developing the story of your strategy, and finding effective ways to tell that story, are important communication skills that a manager or director in an organisation needs to develop. Chapters 8 & 9: Personal & organisational congruence. An important part of communicating strategy, is how personal and organisational congruence influences the message of your strategy. When we listen to presenters or politicians, we instinctively notice how congruent they are. We may think, ‘That person is lying or does not believe what they have just said’. In some cases they may say one thing at one time and something different at another time. In some cases what they say may not align with what they do. Chapters eight and nine address this question of congruence, for individuals, and for the management team and the whole organization. What applies to individuals also applies to the whole management team. If the management team leave the boardroom with different stories, then it will quickly become apparent to the rest of the organization. So, chapter eight describes what can go wrong and helps you address the congruence of the management team before the message gets out. That way the message is consistent and aligned. This congruence also applies to the whole organization. This is not just about the people telling the story. Are you about to communicate a strategy, only to be undermined by the very organization in which it will operate? Chapter nine, ‘The handcuffed organization’, provides ways you can check the coherence and integrity of the whole of the organization’s message. It provides a checklist of organizational processes, systems and cultural components that you can use to ensure the message is not undermined. All the way through the book there are short exercises and questions to address. The purpose of these is to build up a resource of information that we can use to develop the plan for communicating the strategy. Finally, chapter ten will bring all these pieces together. It guides you, with the resources you have developed in working through the book, to develop the plan to communicate your strategy together with a contents list for that communication strategy document. Then it is up to you: get out there, communicating and starting to socialise your strategy. Are you serious about communicating your strategy and engaging your people? If you are serious about improving how you manage performance, and changing behaviours, then get in touch. You can read the case studies of our work with clients, or the many articles in our blog. You can learn about the techniques in the book. But to really find out how we help clients, you’ll have to talk to us….